20 cm 214 p. : ill. Reprint. Originally published: New York: Harry N. Abrams; London: Puffin, 2009. 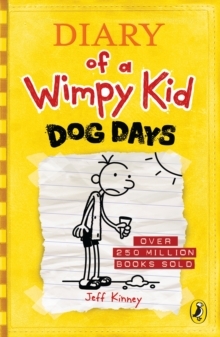 It's the summer, and we're back with Greg Heffley and his crazy family in the fourth mega-selling instalment of Jeff Kinney's hilarious Diary of a Wimpy Kid series! The way I like to spend my summer holidays is in front of the TV, playing video games with the curtains closed and the light turned off. Unfortunately, Mom's idea of the perfect summer holiday is different from mine. This summer, a beach holiday isn't on the cards, and Greg's mom's vision of 'family togetherness' really doesn't sound a whole lot of fun. But there's a brand-new addition to the Heffley family to contend with and it looks like Greg might be outnumbered. It could be a real dog of a summer . . . The perfect series to get children of 7+ interested in books. Even those who struggle with reading won't be able to put Greg's diaries down!